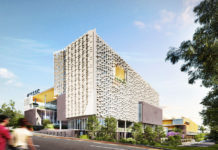 A new DA has been submitted by Forza Capital for 365 St Pauls Terrace in the Fortitude Valley. Two towers, one 26 and the other 27 levels high are planned for the site which incorporates a former 1930’s heritage patisserie building into the design. The development which comprises 260 apartments in a podium and tower form is a brilliant example of how development should be integrating heritage buildings into the design, not just to add character and ambiance to the project, but also to illustrate an evolution of former uses of the site. 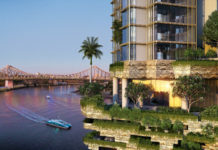 This is in stark contrast to a development by billionaire mining magnate Sam Chong who has gained approval by the Queensland Heritage Council to demolish the century old Bonded Stores row of buildings in the CBD. Retail tenancies are proposed at ground level within the retained part of the heritage listed McDonald’s Bakery (former) building and on Alfred Street. The proposed development provides active frontages to St Pauls Terrace and Alfred Street. The project also comes with a new laneway and small urban space off Alfred Street. 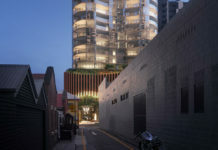 The new laneway and small urban space will be activated by retail, which is contrary to its current use as a leftover under utilised service lane. On Alfred Street, retail tenancies are provided, one at the corner of Alfred Street and the laneway and the other at the centre of the frontage. Both tenancies include high level glazed finishes to the street frontage and provide a source of activation and causal surveillance to the street. The DA number for this development is (A003852027).